Implemented by: GEOVAP, spol. s r.o. Tecomat Foxtrot runs as a datalogger for the visualization and archiving of data from gas-volume conversion devices and chromatographs at the Brandov Border Transfer Station. During 2009, due to the gas crisis caused by the Ukraine-Russia gas disputes, gas deliveries to the Czech Republic were interrupted. Because of this, it was decided to build a new natural gas pipeline named Gazela. Building the gas pipeline ensures that the Czech Republic is no more dependent on natural gas imports transported through Ukraine. 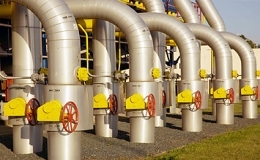 Thanks to Gazela and OPAL, a natural gas pipeline in Germany, which are interconnected on the German-Czech border near the village of Brandov, the Nord Stream pipeline supplies the Czech Republic with natural gas from northern parts of Russia. 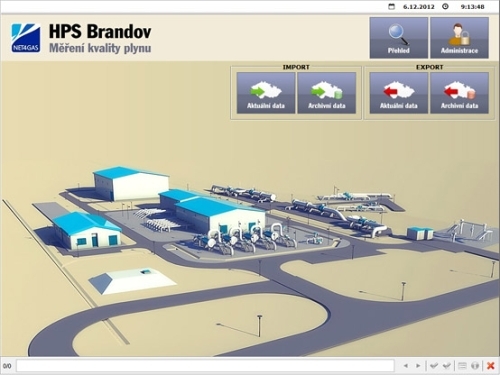 The entire transfer station, including the system of data collecting and archiving at Brandov, is operated by NET4GAS. This company operates more than 3600 kilometers of gas pipelines in the Czech Republic. For visualization purposes, the Reliance SCADA HMI system is used. On two touch panel PCs, Reliance communicates with a Tecomat Foxtrot CP-1000 PLC. This PLC is equipped with a SD memory card on which data is stored and archived for more than a period of one year. In addition, data for the last 14 days is stored in the PLC's retain memory so that no data loss occurs when removing the SD card. Based on customer requirements, a user-defined program for peripherals operation and data management was suggested to be used. The Reliance system enables the NET4GAS staff in Prague to remotely monitor the consumption of gas using the Reliance Web Client module. A detailed description of the solution can be found at www.reliance.cz.